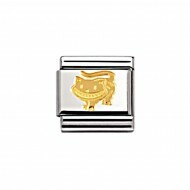 Composable Nomination Classic Gold Fantasia Cheshire Cat Charm, a stainless steel base link with 18ct Gold. Composable Nomination Classic Gold Fantasia Flower Fairy Charm, a stainless steel base link with 18ct Gold. Composable Nomination Classic Gold Fantasia Friendship Fairy Charm, a stainless steel base link with 18ct Gold. Composable Nomination Classic Gold Fantasia Frog Prince Charm, a stainless steel base link with 18ct Gold. 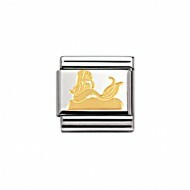 Composable Nomination Classic Gold Fantasia Mermaid Charm, a stainless steel base link with 18ct Gold. Composable Nomination Classic Gold Fantasia Peter Pan Charm, a stainless steel base link with 18ct Gold. Composable Nomination Classic Gold Fantasia Prince & Princess Charm, a stainless steel base link with 18ct Gold. Composable Nomination Classic Gold Fantasia Unicorn Charm, a stainless steel base link with 18ct Gold. Composable Nomination Classic Gold Fantasia Witch Dragon Charm, a stainless steel base link with 18ct Gold.